Each space is 10'x10' and comes with one (1) 6-foot table and two (2) chairs. Electricity will be available but may be limited. If using electricity, power cords, lighting, credit card machines, cash registers, etc. are the vendor's responsibility. Additional tables may be rented for $10 each, but they must be requested at the time of application. If you will use lighting, we suggest you use only LED lighting. Vendors using any type of partition, screen, etc. that is 4-feet or taller will be required to rent spaces by a wall. Each space rental includes one (1) vendor pass. One additional vendor pass may be purchased for $15 for each space rented. Please indicate below if you want to purchase additional passes. Set-up begins at noon on Friday – February 15 and should be completed by 5:00 pm. Tear - down should be completed by 9:00 pm on Sunday. You may be able to park close to the pavilion to unload and load; then all vehicles must be moved to marked parking spaces. Please note: There will be a $5.00 parking charge per vehicle/per day for all vehicles arriving after 4:00 pm on Friday and all day Saturday and Sunday. 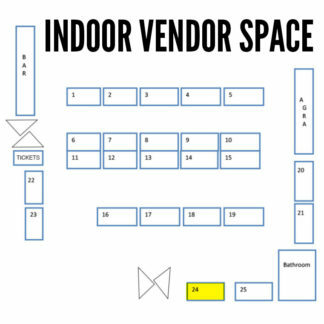 Please see "Related Products" below for additional tables and vendor passes.